Despite the extra amount of travel time needed, I enjoy doing my studying in different places around Greater Vancouver. I claim that studying in different places helps me remember things better, but most importantly, I get to go to different sushi restaurants in the process. One of my favourite places to study is the Port Moody Public Library (even though I don't live in Port Moody), and I've been stealing their Wi-Fi and desk space on numerous occasions. 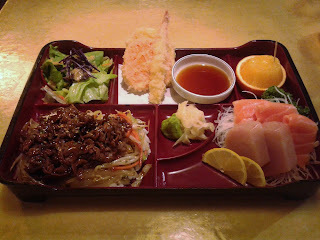 Over two such occasions, I completed a Sushi-a-thon at Namoo Sushi while my brain was overflowing with math formulas. Namoo Sushi is Korean-operated and has a very extensive menu. The dining area was spacious and decorated with many Japanese fans along with an endearing water fountain. I found the booth seating a bit tight, and I had some trouble getting into the seats. Just to be clear, I am neither beefy nor well built. If you want to picture my body shape, just think of one of those feeble nerds who spends too much time studying and you'll have approximately the right idea. 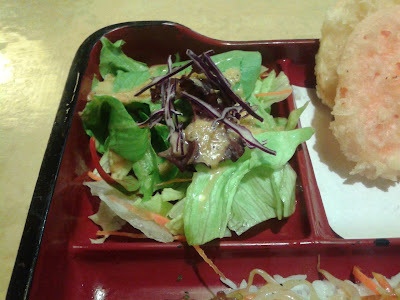 To get a sample of everything, I started with the Sashimi Box, which came with a Miso Soup. 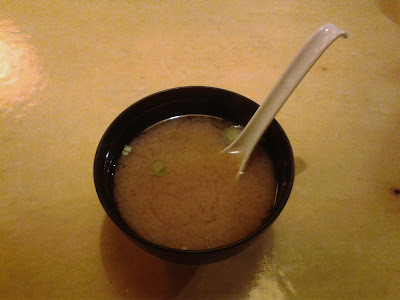 The Miso Soup arrived steaming hot and came with green onion and tofu. It was well balanced with a sufficient amount of flavour. 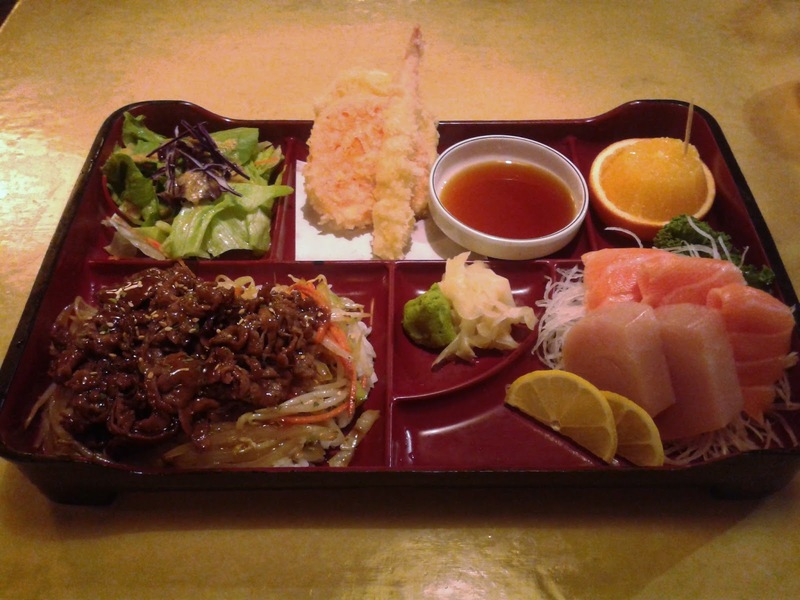 The Sashimi Box was neatly arranged, and the portion sizes were quite generous. Starting with the top-left corner, the Salad was standard fare and consisted mainly of bite-sized pieces of lettuce dressed with the standard Japanese salad dressing. The Tempura came with one prawn and one piece each of sweet potato and yam. 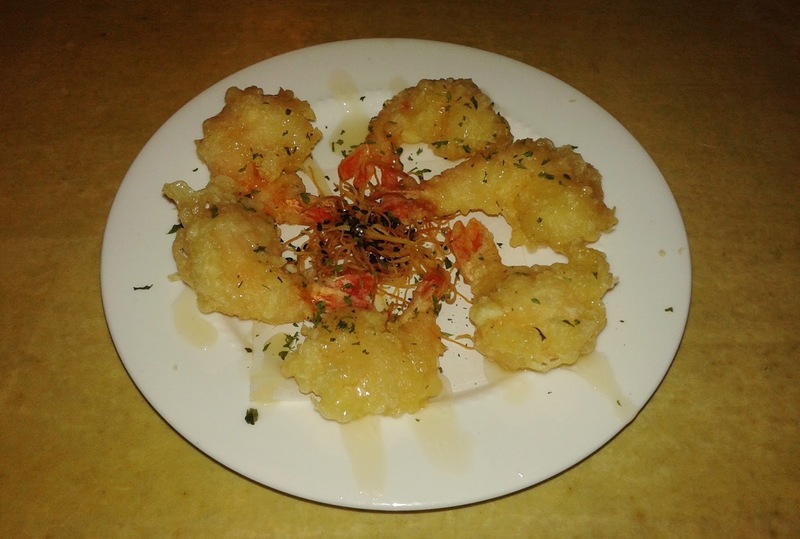 The prawn had an excellent texture and was covered with a light, crispy layer of batter, which provided a delicious, savoury burst of flavour. The batter on the sweet potato was a bit heavy, but both the yam and the sweet potato exhibited a good balance of sweet and savoury flavours. As strange as it may be, I have always rated single pieces of fruit on this blog and will continue to do so. I found this piece of orange neither sweet nor sour, but it was sufficiently juicy. The Salmon Sashimi blew my mind. It was extremely fresh and sliced into large, thin pieces for a softer texture. It had the perfect creamy flavour and was definitely the highlight of my entire day. There's nothing in life that can compare to an excellent piece of sashimi, right? The Tuna Sashimi exhibited no fishiness at all and was cleanly cut, though it wasn't very soft. The Beef Teriyaki with Rice came with tender, savoury beef that was dressed with a good amount of teriyaki sauce. 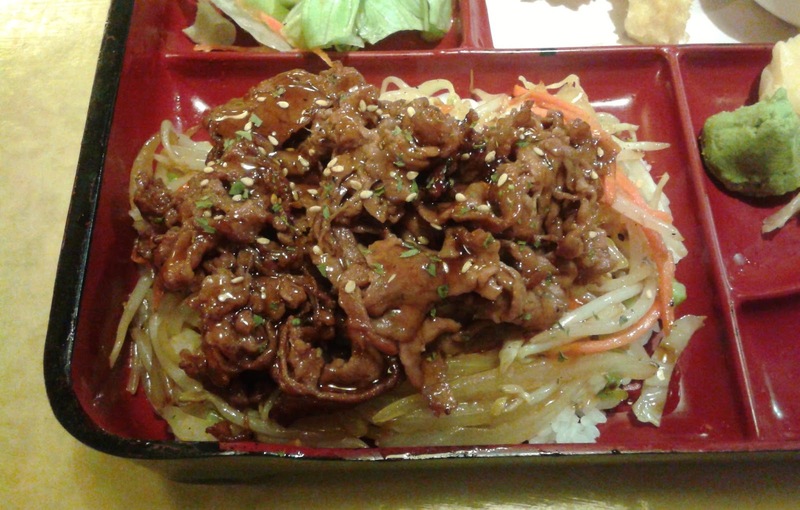 Underneath was a flavourful layer of bean sprouts, chopped onions, and lettuce. A slight hint of black pepper livened up the flavours. I enjoyed virtually every aspect of this dish, though I guess if I was really, really picky, I could say that it was the slightest bit greasy. After finishing the Sashimi Box, I got the Baked Salmon Roll, which came with avocado, crab meat, red pepper, baked salmon, melted cheese, green onion, and bonito flakes. 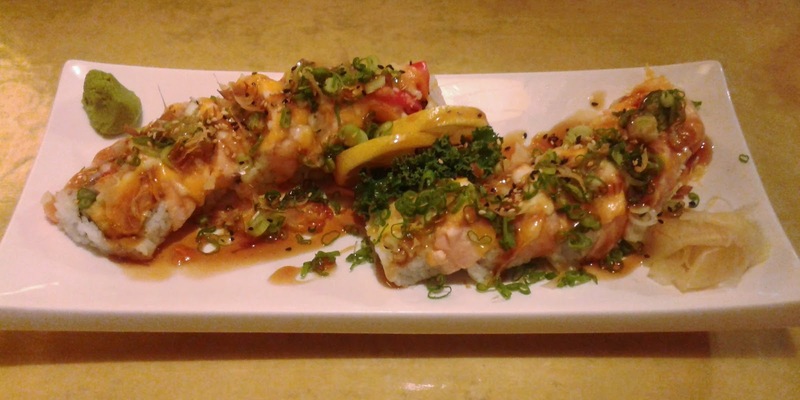 Now, if you're one of those people who eats fajitas and goes "I wonder what these would taste like in a sushi roll," I have no better solution to offer than to try this roll. The melted cheese was a blend of white and yellow cheeses, and the cheese + baked salmon + teriyaki sauce combo sort of worked. 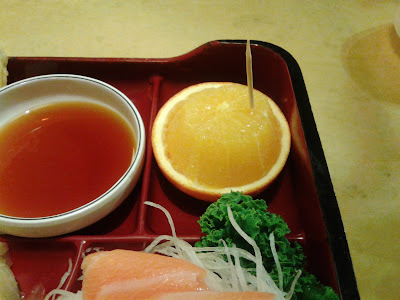 The salmon was not fully cooked to retain a smooth texture, and there was a generous amount of salmon. 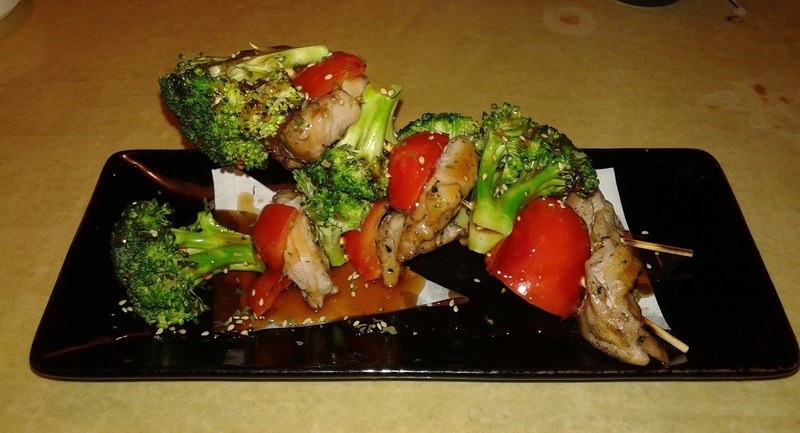 The Yakitori comprised two extremely bulky skewers, each with several gigantic chunks of broccoli. Thrown into the mix were a few large, crunchy pieces of red pepper. The chicken, no longer the center of attention, was sufficiently juicy and tender, and the broccoli had a subtle seared flavour. While I wasn't paying attention, one of the wooden skewers magically broke apart into three pieces, possibly due to its own weight. The "mysteriously disintegrating skewer" is a skill that I have never witnessed before. 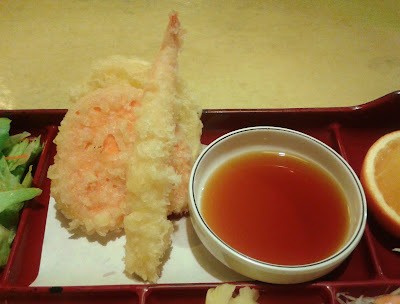 The Ebi Mayo came with six battered shrimps dressed with mayonnaise and a bit of honey for some extra sweetness. The shrimp had a decent snap to it, and I liked how it was peeled all the way to the tail, making it cleaner and more convenient to eat. However, the honey made the batter slightly chewy in places, and the shrimp still remained weak in flavour. The rest of my order was exquisitely plated with a beautiful shrimp head in the middle. 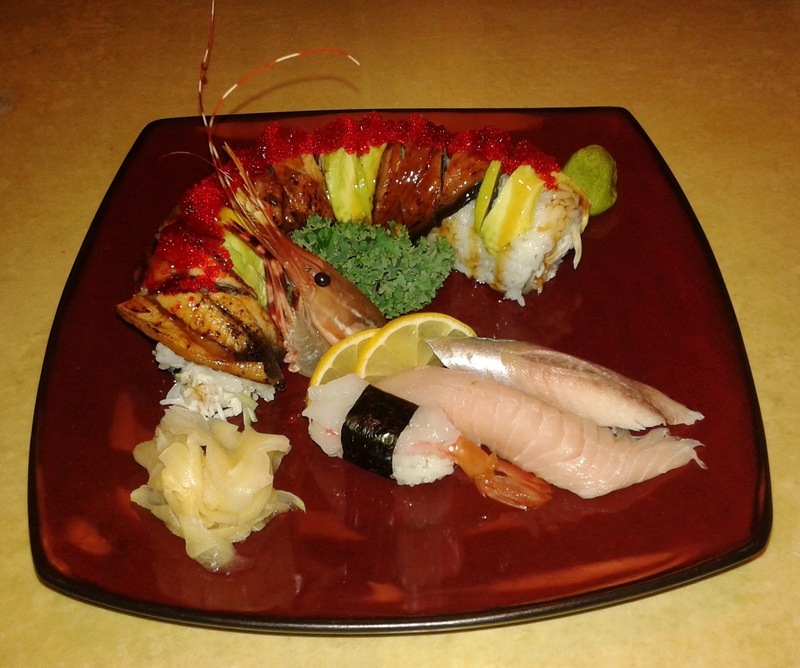 Behind the shrimp head is the Dragon Roll, which came with crab meat, cucumber, avocado, tobiko, BBQ eel, and teriyaki sauce. The crab meat was very rich in flavour and made the roll quite addicting. The unagi was pleasantly soft and had a savoury, sweet flavour. Once again, the raw seafood was fresh. The amaebi (sweet shrimp) was creamy with a slight, appealing snap, while the toro was soft and came in a very generous piece. The Toro Nigiri is one of those rare times where I thought there wasn't enough sushi rice underneath. 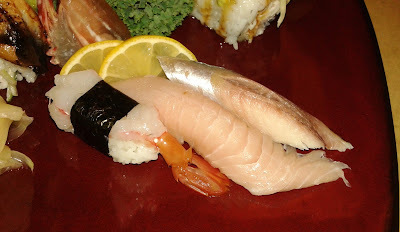 However, the Saba Nigiri (mackerel) was excellent. Not only was the saba very fresh, but it also had just the right amount of saltiness and just the right amount of sushi rice. The smooth, soft texture of the saba added a few points to the delicious-o-meter. 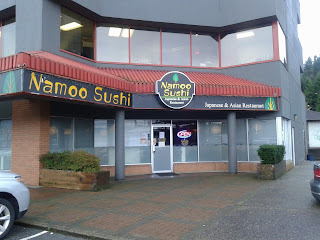 I actually passed by Namoo Sushi today haha! "one of those feeble nerds who spends too much time studying." Haha outeating buff guys I can do! My Christmas didn't involve sushi as sushi restaurants are closed today, but I did have some wonderful turkey, courtesy of Mom. I hope you had some excellent food too!